This report offers findings about how supporters of current presidential candidates–Hillary Clinton, Ted Cruz, John Kasich, Bernie Sanders, and Donald Trump–view global warming, how those views will affect their vote in the 2016 elections, and how they think citizens and government should address global warming. This report was prepared prior to Ted Cruz’s (R) suspension of his presidential campaign. Mr. Cruz’s supporters are the most likely to think climate change is not happening. Leiserowitz, A., Maibach, E., Roser-Renouf, C., Feinberg, G., & Rosenthal, S. (2016). 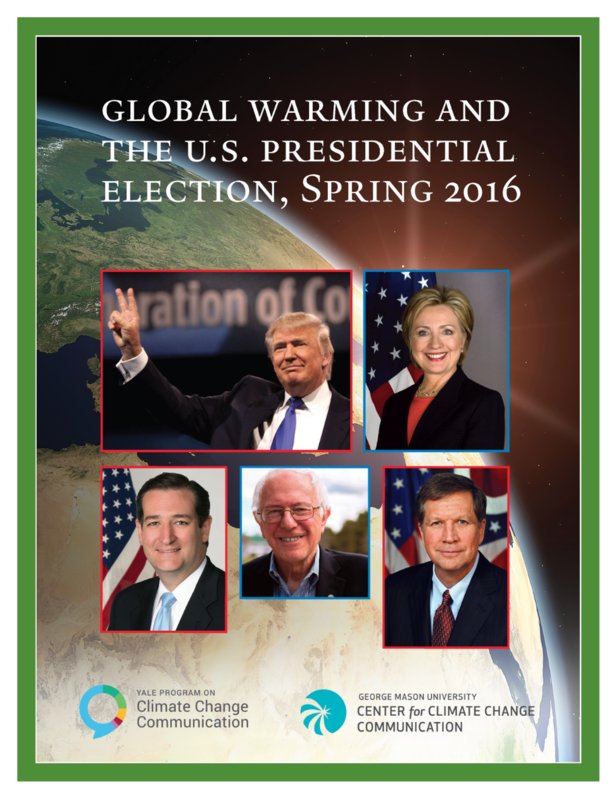 Global Warming and the U.S. Presidential Election, Spring 2016. Yale University and George Mason University. New Haven, CT: Yale Program on Climate Change Communication. The research was made possible by the generous support of The 11th Hour Project, the Energy Foundation, the Grantham Foundation, and the MacArthur Foundation.